In last week’s piece covering Kinder Morgan I briefly went over why midstream energy assets can make attractive long-term investments. By that I’m basically referring to the infrastructure that links the oil & gas producers with the refineries and distributors of end products – things like transportation pipelines, storage terminals and so on. Granted not all of these assets are created equally, but in terms of avoiding the usual pitfalls of the energy sector the ‘toll booth’ business model seems to be a fairly stable, cash generative one. Today I want to go over what looks like one of the more attractive midstream names right now: Shell Midstream Partners (NYSE: SHLX). We are a fee-based, growth-oriented master limited partnership recently formed by Shell to own, operate, develop and acquire pipelines and other midstream assets. Our assets consist of pipelines, crude tank storage and terminal systems that serve as key infrastructure to transport and store onshore and offshore crude oil production to Gulf Coast and Midwest refining markets and to deliver refined products from Gulf Coast markets to major demand centers. As mentioned above Shell Midstream has its roots in energy giant Royal Dutch Shell (RDS). Now the thing with a company the size of RDS is that it can be kind of hard to a get a handle on the value of all its individual assets due to the sheer scale of the balance sheet. Last time I checked we’re looking at something like $300 billion worth of net fixed assets here in total. In addition, most folks tend to focus on the upstream assets in particular (that’s the exploration and production side of things). 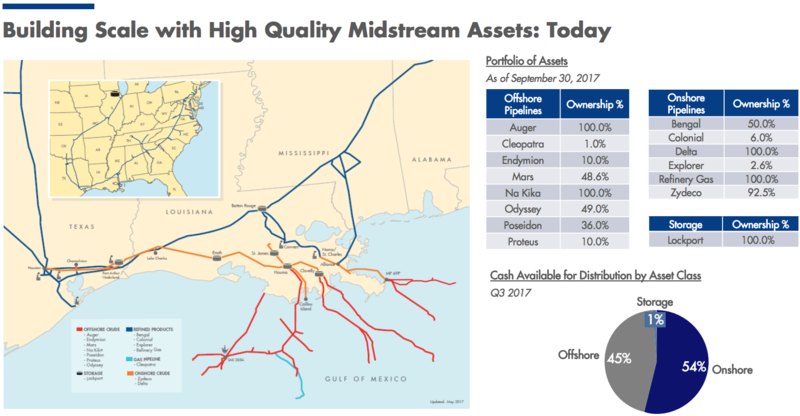 As far as Shell is concerned spinning off certain midstream assets therefore allows it to raise cash and unlock some value in a segment that investors previously weren’t interested in. Due to the ownership structure of Shell Midstream it can do this whilst also retaining operational control and a share of current and future cashflow. As far as investors are concerned the relationship between Shell Midstream and RDS throws up a couple of big potential plus points. The first is the credibility of the sponsor, and when it comes to oil & gas they don’t come much bigger than RDS. Having such a big player in the US energy space standing alongside you and your investment provides some solid assurances as to the quality and strategic importance of the underlying assets. The second point is that unlike many MLPs Shell Midstream has a potentially large runway for future growth. Remember that the parent company is one of the largest players in the US energy space. It has plenty of assets that could eventually drop down onto Shell Midstream’s balance sheet. This would then translate into more fees for the group and growing distributions for both the unitholders and the parent company. Not only that, but because of point one, you can be sure that said assets will generally be high quality with strategic importance to overall North American energy infrastructure. 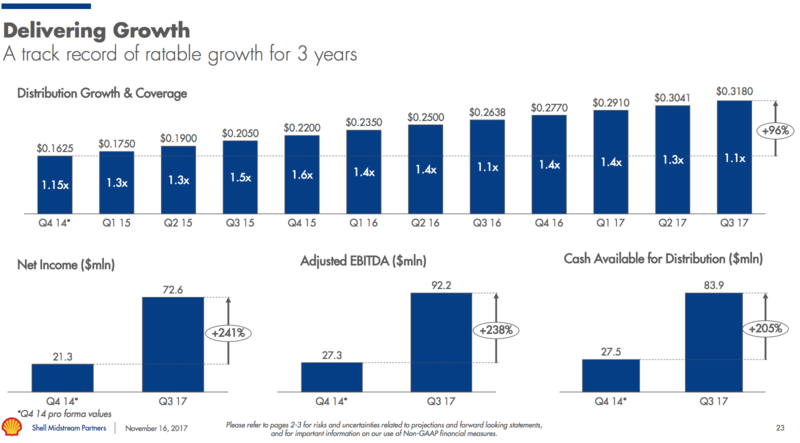 In terms of growth to date Shell Midstream has pretty much trebled its distributable cash flow (DCF) since coming onto the market back in 2014. The quarterly per-share distribution has almost doubled, increasing from $0.1625 in late-2014 to $0.3180 in the third quarter of 2017 – all healthily covered by both DCF and indeed traditional free cash flow. I’d add a couple of additional points to the list which are unrelated to the parent company. The first is just to reiterate that we’re talking fee-based revenue locked into long-term contracts. In other words it generates relatively stable cash flow that isn’t so sensitive to underlying commodity prices. The second point is regarding the state of the balance sheet. With net debt currently equal to approximately 2x annual cashflow it seems to be in fairly good health. When you throw all those four points together – great sponsor, stable cashflow, good growth prospects and a healthy balance sheet – it adds up to a pretty compelling long-term investment case. The only question left to ask concerns the current valuation. How does Shell Midstream Partners fare on that basis? Actually not too bad. Based on the trailing four quarters the shares are currently yielding a 4.5% distribution. Now at first glance that might look pretty unattractive compared to the wider MLP universe, but remember the deal with most MLPs is that a meaty distribution is supposed to make up for limited future growth. However, in the case of Shell Midstream the growth prospects are arguably much brighter than is the case with most MLPs. To attach some specific numbers to it management is targeting 20% compound annual growth for 2018 followed by ‘mid-teens’ in 2019. Or put another way investors can reasonably assume the distribution yield on cost to rise quite substantially over the next few years. Doubly so since the current distribution is covered so healthily by underlying cashflow. Given that shares in the parent company – that’s Royal Dutch Shell – are currently yielding 5.7% then investors may want to take a closer look at Shell Midstream as a possible future income play.